If you guys have been following me for a while, you know jeans are one of my favorite things to wear. I'm always on the search for the perfect-fitting pair of jeans, and I've got a few go-to trust-worthy brands. From high waisted skinnies and distressed details, to cropped flairs and mom jeans, I'm pretty much a fan of them all! For me, I like to keep my denim outfits fairly simple and straight forward. Easy and effortless tops with a pair of sneakers, mules, or pumps. That's why Nordstrom is my favorite destination to shop for denim and everything to pair with it. You might remember a few weeks ago I posted about a "new to me" brand of denim called Boyish Jeans. Well I fell in love with this pair (& really so you did guys because that style is pretty much sold out!). However, during one of my recent trips to Nordstrom I found this pair of high-rise skinny jeans and fell in love with Boyish Jeans all over again. The fit is incredible and the price point is really good compared to most high-end designer jeans! This under $20 t-shirt is a great staple to have for spring/summer. I love the boxy fit which makes it feel a little oversized. Pairing it with my new jeans and favorite beige pumps was a no-brainer. If I'm going out on a date or meeting up with friends, I can guarantee you my outfit will be very similar to this. 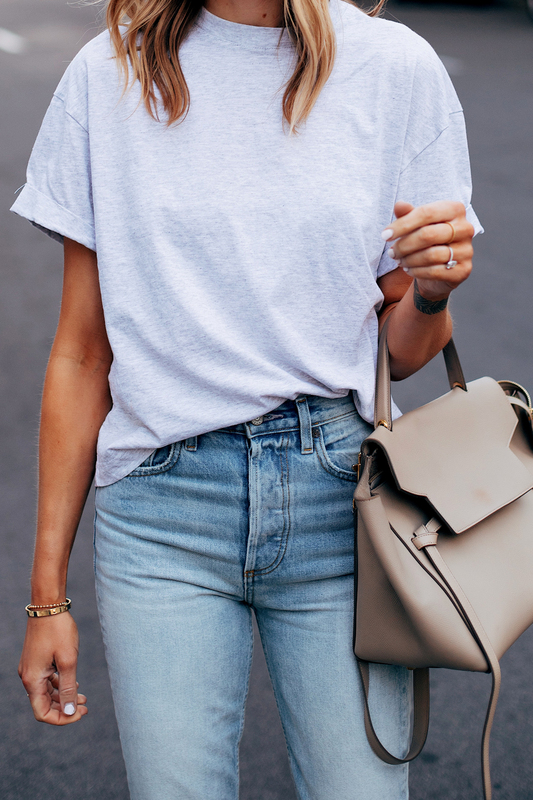 Nothing says casual-chic better than a great pair of denim, a tee, and heels. Make sure to check out Nordstrom for all your denim needs this season. Great post! I love how you know how to dress up basic pieces! I found a post called Always Dress Up, Not Down, from Dress to Impress blog, which has the same theme of dressing up and always looking your best.